The Arts Fund is pleased to announce the opening of the 2014 Teen Arts Mentorship Group Exhibition on Friday, May 30th,2014. The exhibition will feature the work of our largest and most diverse class of mentorship students in recent years. From bronze casting to creative writing, the exhibition will showcase an equally broad array of visual and literary art forms taught in this year’s spring and summer mentorships. The exhibition will be held at The Arts Fund Gallery, located at 205 C Santa Barbara Street,and will be on view until June 28,2014. A public reception will be held in the gallery on the evening of Friday, May 30th from 4:30-7:00 pm. The Honorable Mayor Helene Schneider will be presenting certificates of completion at 5 o’clock sharp. Regular gallery hours are Wednesday-Friday from 12-5pm and Saturday from11-5pm. The exhibition is free and open to the public. For 20 years, this unique arts enrichment program has offered promising teenage artists the opportunity to work closely with local professional master artists in a studio environment. Working in small groups of no more than 10, students receive specialized training, produce portfolio quality work, gain insight into future careers in creative fields, and participate in a group exhibition in a professional gallery. The Teen Arts Mentorship Group Exhibition represents the culmination of students’ work in this program by introducing them to the process of preparing and displaying art in a public venue. 2014’s spring mentorship classes included Assemblage: Mixed Media and Construction with Susan Tibbles, Printmaking with James Hapke, Classical Drawing with Colin Fraser Gray, Bronze Casting with Nevin Littlehale, and Creative Wrtiting: Crafting a Story with Elizabeth Schwyzer. 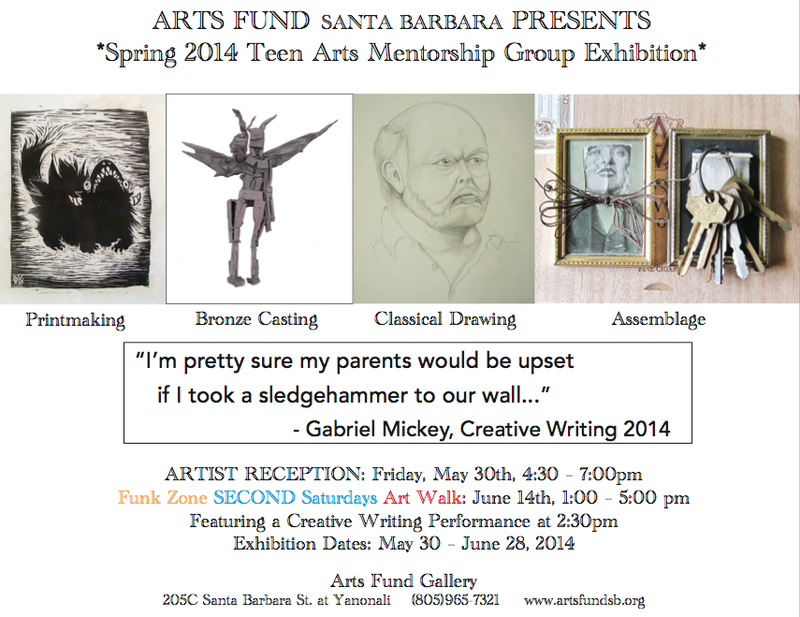 The 2014 Teen Arts Mentorship Group Exhibition will feature students from Dos Pueblos High School, San Marcos High School, Santa Barbara High School, Laguna Blanca, Olive Grove, Crane Country Day School, La Cumbre Junior High, Santa Barbara Junior High, and La Colina Junior High. The spring Teen Arts Mentorship Program is made possible by the generosity of Santa Barbara Foundation, Change Happens Foundation, Towbes Foundation, Wood-Claeyssens Foundation, Richard and Maryan Schall, and Bob and ChristineEmmons. For more information on the 2014 Teen Arts Mentorship Program, or other Arts Fund programs, please call The Arts Fund at (805)965-7321. The Arts Fund (www.artsfundsb.org) was established as a nonprofit in 1983 dedicated to fostering the arts in Santa Barbara County. The organization’s formal mission is to create, fund and administer programs and projects that foster the arts for the people of Santa Barbara County, to act as a catalyst maximizing the effectiveness of arts resources, and to nurture collaborative relationships amongst arts organizations. The Arts Fund is best known as the sponsor of the annual Individual Artist Awards(IAA),a juried competition open to Santa Barbara County artists, and the Teen Arts Mentorship Program that matches promising high school students with professional master artists and writers in a workshop setting. In 2001, The Arts Fund opened The Arts Fund Gallery at 205 C Santa Barbara Street at Yanonali in Santa Barbara’s Funk Zone neighborhood. Gallery sales and private donations are an important and essential source of funding for the organization. Please visit www.artsfundsb.org to learn more upcoming programs and events or how to make a donation to support the work of The Arts Fund. The Arts Fund Gallery is openWednesday–Friday,12-5pm and Saturdays 11–5pm.